Irene Nikolopoulou is a journalist, one of the longest - standing presenters of news bulletins and programmes on Greek television. She made a name for herself from the exclusive interviews she held with international personalities and was the main host of the two official programmes of the Organizing Committee for the Athens Olympic Games in 2004. She was born and raised in the district of Profitis Ilias in Piraeus; she attended the 47th Elementary School and later studied at the 1st State High School for Girls, while from the age of 6 she began to learn French. Showing a particular flair for the arts, she was involved with singing and the theatre throughout her time at High School and into her first years at University. As her mother, Aikaterini Tagalou, came from Ermioni, she spent her childhood summers on this Argolidian peninsula, while she regularly visited Tropaia and Langadia Gortynias in Arcadia, both villages of her grandparents on her father Leonidas’ side. She fell in love with the cinema from her early years, as she always accompanied her film-maker father to the outdoor «Cine Alhambra» in Ambelokipi. She studied Law, Public Law and Political Science at the National and Kapodistrian University of Athens (1976 – 1981). While also involved in the theatrical department at the University, she took lessons in elocution, morphophonology and drama. She intended to become an interpreter, but her plans were upset so she sought a new professional direction and perfected her knowledge of the French, English and Italian languages, studying at Oxford, Nice and Nancy in France and Luxemburg (Universite de Νancy, Universite des Sciences et des Lettres – Nice, Oxford University – Bletchington Park College, Institut Universitaire de Luxembourg). She also received a scholarship from the Ministry of National Economy to attend the College d’ Europe (Bruges). In early 1983 she taught French and English at private schools and was hired as an air traffic controller by the Civil Aviation Authority, a position which she left 3 months later to take up journalism. An electronic journalist from the start of her career, in State television (ΕRT2) for 9 years, in private channels for about 15 years (MEGA, STAR, ALPHA), before returning to ET1 in 2005 and to the satellite channel ERT WORLD which addresses the Greek Diaspora. She worked as a newscaster and presenter, editor and reporter on European and international issues. She travelled to many parts of the world and held exclusive interviews with political leaders, famous artists and eminent people from the arts, letters and sciences. Newscaster and presenter (1983 – 1991), editor – overseas reporter on ΕΤ – 2, newscaster and presenter on Mega Channel (1991-1999), newscaster and presenter on Star Channel (1999-2003), newscaster on Alpha (September 2003 – 2005), newscaster on ΕΤ – 1 (2005 – 2010), presenter of «Greek Panorama» (2-hour live programme) on ERT – WORLD (2006 - 2010). She also hosted the programme of the 2004 Athens Olympic Games Organizing Committee «Olympiada Oli I Ellada (Olympiad throughout Greece)» (2002-2004) and the English-speaking programme «Celebrating Cultural Olympiad» broadcast on Eurosport. "25 years on air, career flash back"
She hosted and was the editor in charge on Greek television’s Breakfast TV show on ET2 (1988-1989) entitled «TA PROINA (In the Mornings)».The show’s theme tune was written by the well-known composer Giorgos Hatzinasios, and it was the first time that morning news reporting was combined with a presentation of topics and people from the arts. When she was hired by Mega Channel shewasaskedtohostnewsandbreakfast shows 3 times (Studio 5 – Froufrou), while the same happened at STAR (Mera me ti mera – Day by Day). Through out her career in television she organized special missions overseas to meet personalities such as Benazir Bhutto (Islamabad, twice in 1989 with ET2), the exiled Yasser Arafat (Tunis, Mega 1982), Lech Walesa (Warsaw, Gdansk, Mega 1994), Corazon Aquino (Manila, 1991) etc. Breaking news wasalsothereasonforspecialmissions, such as covering the death of Princess Diana which turned into the biggest television event of all time (London, 1997). She was also invited to China, then emerging into the western world, by the country’s official journalists’ union (Peking, Xian, Shanghai, 1997). Presenter – chief editor of three special programmes on ΕΡΤ-2 with three famous singers as guests, Charles Aznavour, Shirley Bassey and Tina Turner. At the same time she was on the panels at all elections and presented breaking news, such as the fall of communism in Eastern Europe, Chernobyl, the Gulf War, the collapse of the twin towers, etc. She took part in the 15-day television show «O kosmos kai o Typos (the World and the Press)» (1986), the television charity marathon for children with thalassemia (1987) as well as in the ERT television marathons for Unicef (2005-2010) and the children of Palestine. Journalistic editorial work in special dedications and documentaries, such as «Simone de Beauvoir – Jean Paul Sartre», «Presidential elections - France» (1988), «AIDS and Women – Roundtable» (1990), «Woman and the Media» (1991), «Presidential elections - USA» (1992), «The Palestinian question» (1993), «In Pakistani Greece» – Documentary (1996), «World without clouds – Poland» (1997), «Mission to China» (1998), «Documentary on Greece, EURONEWS» (1999) «Cyprus» (2009), «30 years of European elections» (2009). 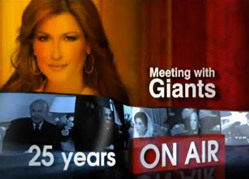 In 2004 she was invited by the European Parliament to host: i) the event «The Olympic Idea in Europe» ii) the conference – television broadcast on «The Expansion of Europe – New Neighbours» joined by personalities of European repute and with links to Greece, Rumania, Poland and Turkey, and iii) the conference – television broadcast on the subject of «Europe, Union of Peoples and Cultures – The Olympic Games throughout the Ages» joined by personalities of European repute and with links to Greece, France, USA, Germany and Australia. These programmeswerebroadcast live over the Internet and satellites throughout Europe, as well as by numerous television channels in Greece. Last but not least, she hosted the programme «GREEK PANORAMA» on ERTWORLD with guests including distinguished personalities from the world of politics and the arts, sports and science from Greece and the Greek Diaspora. Two years before the start of the Olympic Games she was assigned the editorial work and co-presentation (with Babis Papapanagiotou) of the Athens 2004 Olympic Games Organizing Committee’s programme entitled «Olympiada Oli I Ellada (Olympiad throughout Greece)» which was broadcast to 70 regional television stations all over the country and to 8 ethnic Greek TV stations in Europe, Australia and America. At the same time she hosted the most important events in preparation for the Olympic Games, such as the unveiling of the Olympic torch and the opening ceremony of the Olympic Year in Irakleio, Crete, in which 100 thousand people took part (13-8-2003). Sheworkedasan international media consultantfor the Olympic Games’ Organizing Committee, and undertook the English-speaking presentation of the programme Celebrating Cultural Olympiad broadcast by EUROSPORT. Finally she was an active participant in events during the Paralympic Games. She was the top newscaster in English and French, while she received 4 scholarships from the English, French and American governments and received further training in international media in a series of seminars in Paris, London and Washington. In 1989 she received an official invitation from TV5 to the events celebrating the 200-year anniversary of the French Revolution and 100 years of the Eiffel Tower. She was given the opportunity to do personal training – Stage work experience at the BBC, ITV, Channel Four, Independent in London, where she observed news production, editing and reporting at the major TV channels and leading newspapers in Great Britain. In 1986, during work experience lasting several days in Paris, she took part in the preparation of news bulletins and broadcasts at TF1, FR2 and FR3. She also did work experience at the TV channels Arte, Canal Plus, M6, at the newspaper Le Monde and at the major radio stations in France. The well-known presenters Patrick Poivre d’ Arvor, Christine Ochrent, Yves Mourouzi, Bernard Pivot, Claude Serillon, William Leymergie, Michel Drucker familiarized her with the production of TV programmes according to the French journalistic «school». She collaborated with «ΕRΑ-2», (February 1995-December 1997) introducing and hosting the music programme «PARIS-ATHENS» featuring French songs. She worked for the newspapers «TOVIMA» (Free reportage) (1984) and «TA NEA» (Free reportage – Interviews, in charge of the column «Ta Athinaika Nea (Athenian News)») (1985). OulofPalme (1985), Raul Alfonsin, Francois Mitterrand (1988), Margaret Thatcher, Felipe Gonzalez, Jack Lang, Benazir Bhutto, Corazon Aquino, Giovanni Goria, Gro Harlem Brundtland, Michel Rocard, Wilfried Martens, Edward Heath, Shimon Peres, Alain Juppé, Sir Leon Brittan, Simone Veil, Lord Plumb, Marcelino Oreja, Yasser Arafat (1993, 2000), Catherine Lalumière, Lech Walesa, Jacques Santer, Lionel Jospin, Romano Prodi, Nicole Fontaine, Valery Giscard D’Estaing, Jacques Chirac, Boutros Boutros - Ghali, Shaukat Aziz (2006), Jacques Rogge (2008), Juan Antonio Samaranch, José Manuel Barroso, Hans-Gert Pöttering, Michaëlle Jean (2009) and others. Luciano Pavarotti, Tina Turner, Shirley Bassey, Charles Aznavour, Claudia Cardinale, Keanu Reeves, Montserrat Caballé, Tom Hanks, Anthony Quinn, Gwyneth Paltrow, Bruce Willis, Pierre Cardin, Robert De Niro, Ben Affleck, Arnold Schwarzenegger, Oliver Stone. A full page of her biography is taken up with her involvement in women’s issues and with promoting women into Greek and European Politics. She actively participated, as a member and as communications consultant, in the establishment of the Select Committee on Women and the Women’s Political Association with the aim of lobbying all parties to strengthen female presence in parliament (Anna Karamanou (PASOK), Teta Diamantopoulou (Political Spring), Soula Panaretou (Coalition), Vilma Sinanoglou (New Democracy) and others. In 1994 she drew up and submitted a proposal to the European Commission DG.X and received the approval of Veronique Houdart – Blazy (Chef du Secteur Information Femmes) for the foundation of the European Network of Greek Women Journalists (EDED). EDED was established in 1995 with Irene Nikolopoulou as president and in May 1995 a press conference was held to announce its foundation attended by representatives of all political parties, social agencies and personalities from the arts and letters. Forover 10 years EDED (whose members numbered 200 throughout Greece) organized innovative informative events – meetings, conferences, visits by journalists to Brussels and Strasbourg and participate dinnumerous European programmes (Eurobus, Equal, etc.) so as to keep Greek women better informed about European policies, to strengthen their presence in public affairs and familiarize regional journalists with European issues. It also issued the quarterly newspaper «ALetterforYou» for several years, carried out and drew up the survey «The Profile of the Greek Woman Journalist” in collaboration with the Audiovisual Institute (1998), and participated in the implementation of the subsidized programme «PROFESSIONAL INTEGRATION AND DEVELOPMENT OF FEMALE JOURNALISTS» at the centre for Lifelong Learning and Vocational Training at the Panteion University (1997). Asamembershe helpedwith the organization of the conference held by the World Organization of Authors and Journalists in Athens. Honorary member of the committee for the two hundredth anniversary of the French Revolution (1989). In 1990 Irene Nikolopoulou married the architect Myron Toupogiannis and in 1993 they had a daughter, Elena, who is at present studying business and management at King's College in London. A great fan of the cinema and the theatre, she also enjoys dancing, travelling and cooking. ShecollectsVenetianglassobjects with engraved silver images. Over recent years she has spent time on social media and on familiarizing herself with electronic means of communication.